China Ramps Up U.S. Investments, From Straws To Semiconductors : Parallels Chinese investors are on a buying spree in the U.S., moving their operations here or snapping up American companies. Investment is on track to hit $30 billion this year, doubling last year's record. 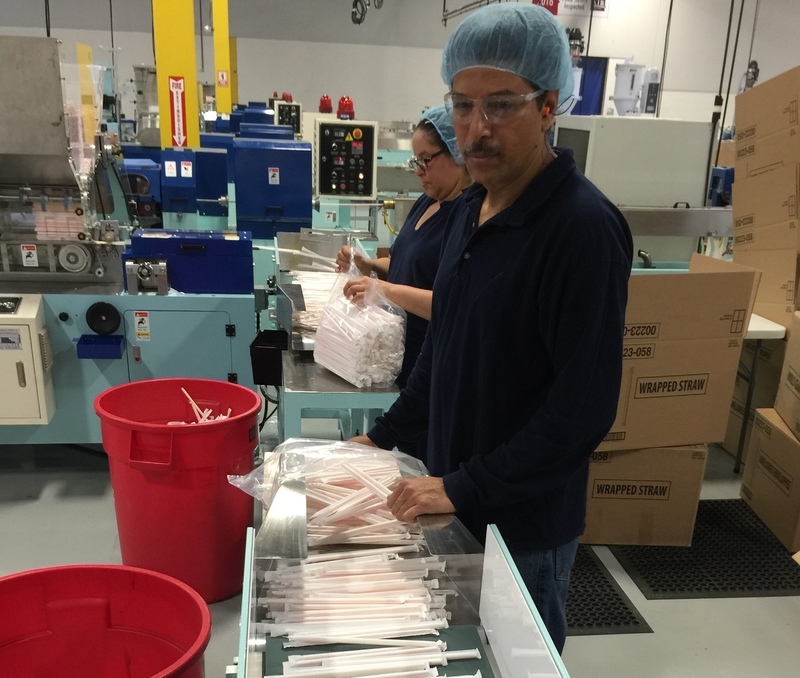 The Chinese company Fuling Plastic set up a plant in Allentown, Pa., last year. The company, which makes straws and other plastic products, supplies fast food chains. Chinese companies are expected to invest about $30 billion in the U.S. this year, doubling the record set last year. Chinese companies are on a major shopping spree in the U.S. They're set to break a record for investment deals this year, snapping up everything from entertainment companies to methanol plants. Most of these investments are takeovers, though Chinese companies are also expanding their existing operations to the U.S. They include Fuling Plastic, one of China's largest manufacturers of plastic cutlery, cups and straws. Its biggest customers are fast food chains in the U.S.
Fuling Plastic has been supplying American customers for about eight years, manufacturing in China and shipping its products to the U.S. A year ago, Fuling opened up operations in Allentown, Pa., transforming an empty 80,000-foot warehouse into a factory for its plastic straws. Now, at any given time of the day or night, machines at the plant are churning away, producing and wrapping drinking straws. Gilbert Lee, who runs the Allentown operation, says that's a lot of straws over the course of one year. "It would be a few hundred million," he says. "We have already made enough straws to go around the world one and a half times." Lee, a U.S. citizen born in Hong Kong, says it was a strategic business decision to open up an American factory. He says it will save shipping time and millions of dollars in freight costs. "First of all, a lot of our customers really like the fact that our products are made in the U.S.," he says. "And then we'll be able to cut about a month of delivery time because it had to ship by ocean freight" when the straws were made in China. Fuling Plastic currently employs 43 people, including a few workers from China. A new factory is important in a place like Allentown. For decades it was an area dominated by heavy manufacturing. But a generation ago, large corporations moved elsewhere and jobs dried up. Don Cunningham, president of the Lehigh Valley Economic Development Corp., says his group lobbied hard to get Fuling Plastic into the area in the hopes that other Chinese companies would follow. "My belief was that once one comes and breaks the ice, so to speak, there's a [comfort level] that others will tend to look at the same area," he says. "If someone's already done the due diligence and it seems to work, then you have a better chance of a pipeline behind it." Fuling Plastic may be the first Chinese company in the area, but it represents a fast-moving trend playing out more broadly. Some acquisitions have been very large, like the nearly $2 billion purchase of the Waldorf Astoria hotel by a Chinese insurance company. This year, direct Chinese investment in the U.S. is projected to hit a record $30 billion. That's double last year's record. "We're now looking at 90,000 Americans that are directly employed by Chinese organizations in the U.S.," says Steve Orlins, president of the National Committee on U.S.-China Relations, which co-authored a report studying the surge of direct Chinese investments over the past few years. He says Chinese companies have been scooping up all types of businesses. "There is travel and leisure; we're seeing lots of investment in hotels," he says. "We've seen billions of dollars in investment in entertainment, automotive parts, semiconductors." Nicholas Lardy, with the Peterson Institute for International Economics, says Chinese investment is getting a lot of attention because it's increasing so rapidly. But it accounts for less than 5 percent of the investment coming into the U.S.
"Our traditional trading partners like the U.K., Canada and so forth are the really big investors," he says. Still, Lardy says Chinese investment will continue to grow. He says in the past, it was mostly state-run Chinese companies that invested abroad. Now, thanks to economic changes by Beijing, it's mostly private companies on a buying spree. "Some of them are expanding because of opportunities. Some are expanding because of low prices. But the underlying factor I think is liberalization," he says. "I think private companies have better access now to borrow money to make the acquisitions." Back at the Fuling Plastic factory, Gilbert Lee says the future of the company is looking very positive. It became a public company listed on the Nasdaq last year, which will help give it an image as being reputable and transparent. "We have a lot of very loyal customers already. But new customers, seeing that we have established our manufacturing base in the U.S., now they want to do business with us," he says, adding that the company is due to expand over the next year, doubling its work force.